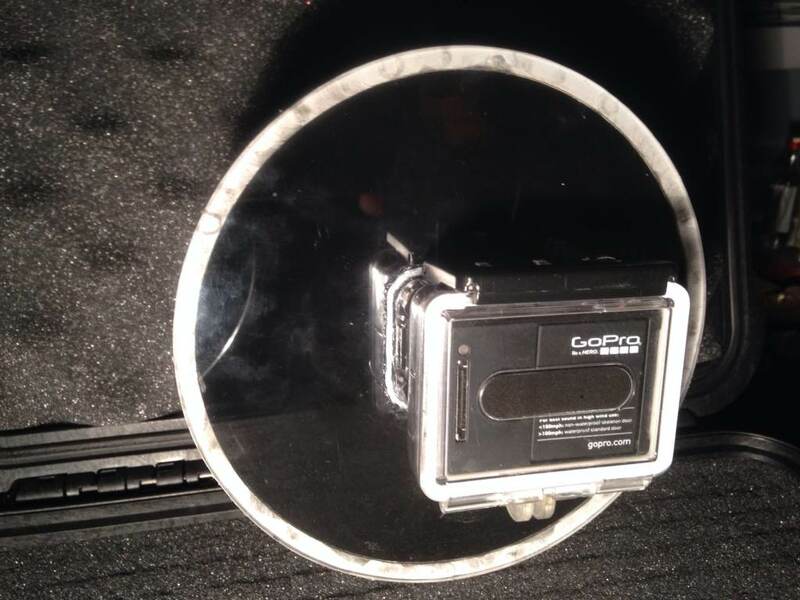 Ian Matsko e-mailed and asked me for some advice on where to get a dome for a DIY GoPro Dome port, I let Ian know that if you’re in the USA you can get good quality acrylic domes from marine compass suppliers. I also said that I’d probably recommend hanging on and waiting for a commercial option like the KNEKT dome as it would take a lot of time and effort to make something of similar quality and it might end up costing the same anyway. I’m happy to say that I was wrong in this case, and Ian has written a detailed guide that lets you know how to make one yourself for about half the price of the commercial option, bare in mind that you need some tools, skill and patience to get a result as good as Ian’s. 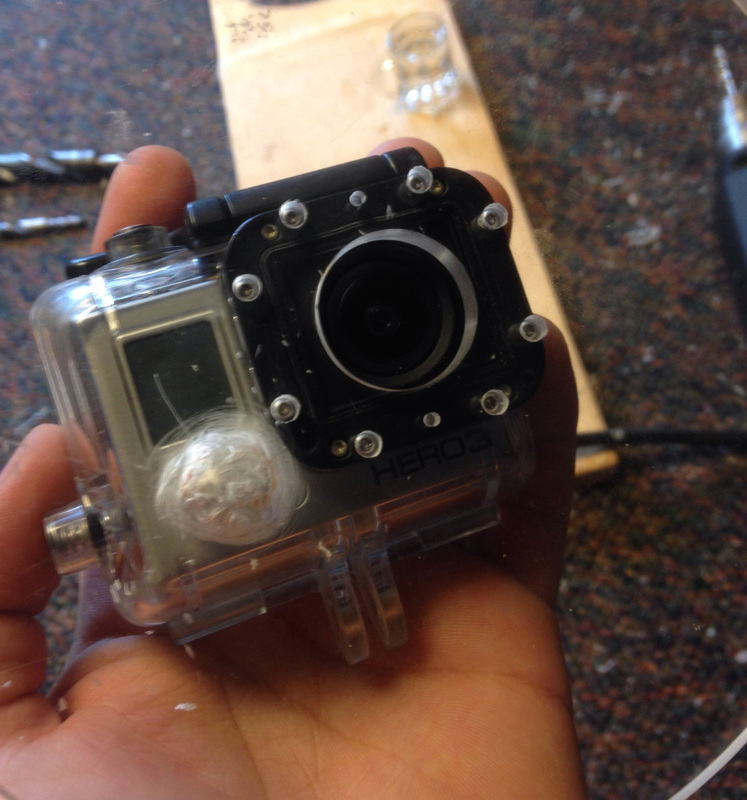 Many of you have asked about a cheaper alternative for a GoPro Dome which will allow the over/under style shots, well this is your best option, so you can thank Ian for ignoring my advice, doing the hard work and documenting the process so well. To construct the back plate from the acrylic sheet you’ll want to work with squares cut a little larger than the diameter of the dome you will be using.The 6” dome has a 5 mm (roughly 1/4’’) thick wall so at least a 6.5” diameter circular back plate will be required. There are ways to cut perfect circles using a router and a circle cutting tool marked with various radii that is screwed onto the bottom of your handheld router. I tried making one but didn’t have the scrap material or the patience. So I basically attached the router to the router table and clamped a piece of wood to it with a hole near one end. I then drilled a hole in the center of my square of acrylic. This will be your pivot point. With the wood clamped to the table I arranged it with the router bit so that the hole was half my desired diameter for the back plate. I used this pivot to spin my acrylic around and achieve a perfect circle. Also take the time to sand the outer edge of the back plate to get rid of sharp edges and to give it a more refined look and feel. Note: Acrylic gets hot and melts very easily due to friction. Having a centered hole in your circle back plate will allow the next, most important, and probably fragile step in creating the back plate. 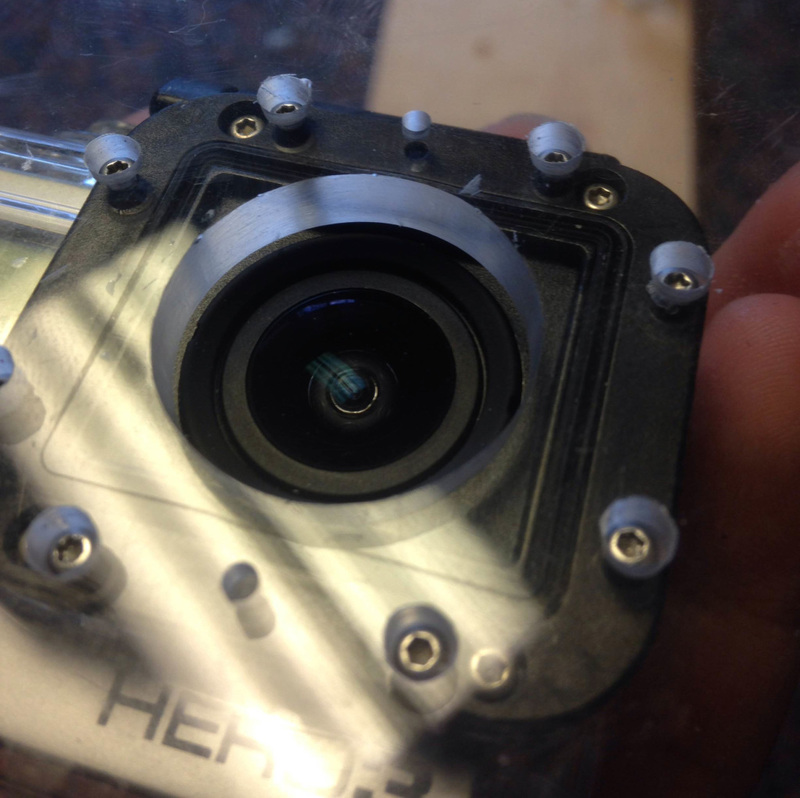 You have to line up and drill 8 perfect matching screw holes to the ones in the Hero 3 housing. It is vital that these are spaced correctly since you will be joining the back plate to the actual housing using the original screws. Unscrew the square plastic retaining ring from the housing with the T5 torque screwdriver. Using the retaining ring and the 5/64th inch drill bit I suggest drilling shallow notches in the acrylic for the pegs on the back of the retaining ring to sit in flat with the acrylic (you’ll see what I’m talking about when you unscrew the retaining ring from the housing). Tape down the square and fit the two pegs into the shallow notches to keep it from moving when you drill the holes. The 5/64th bit will be able to go through the ring holes without much trouble but the drill bit is a hair wider than the housing screws are. With this finished the last step will be to take a wider drill bit (anything wider than the screw heads within reason) and drill to a depth that leaves 1/16th inch thick acrylic between the screw head and the housing. This is because if you notice on the housing the thickness of the plastic retaining ring where the screws are located is approximately 1/16th of an inch and you’ll want a similar fit. This step is very sensitive as it is easy to make a mistake and drill straight through the acrylic. When you place the back plate against the housing you will notice that the Power/mode button on the housing protrudes too far and you are unable to get the acrylic flat with the housing. This is sort of a tricky bit. You will need to carve a hole into the backside of the acrylic to accommodate the button without going completely through it. I used a drill and an oversized drill bit to carve it out but this is something you’ll have to perfect on your own, just keep carving and checking the fit and if you can find a better way to do it then go for it. If you’ve gotten this far I suggest ordering the dome if you haven’t already. I waited just to make sure I could build the back plate that way if I couldn’t I would only be out the $20 for the acrylic instead of $90 for the acrylic and the dome. 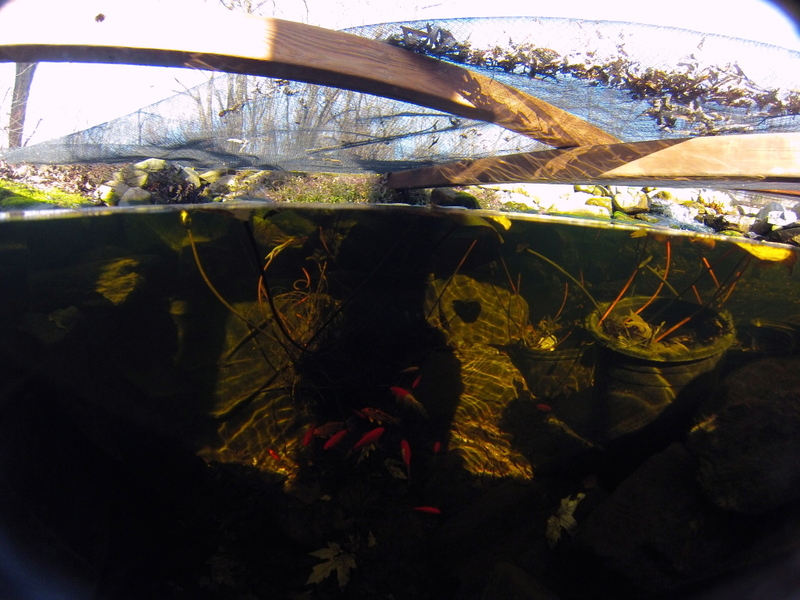 You’re going to want to paint the acrylic black to prevent unwanted reflections inside your dome. I only painted the front facing side because this won’t be exposed to the water and it creates a cool effect with the clear polished back. Before painting I sanded the front facing surface of the back plate simply because it seemed like a good idea. 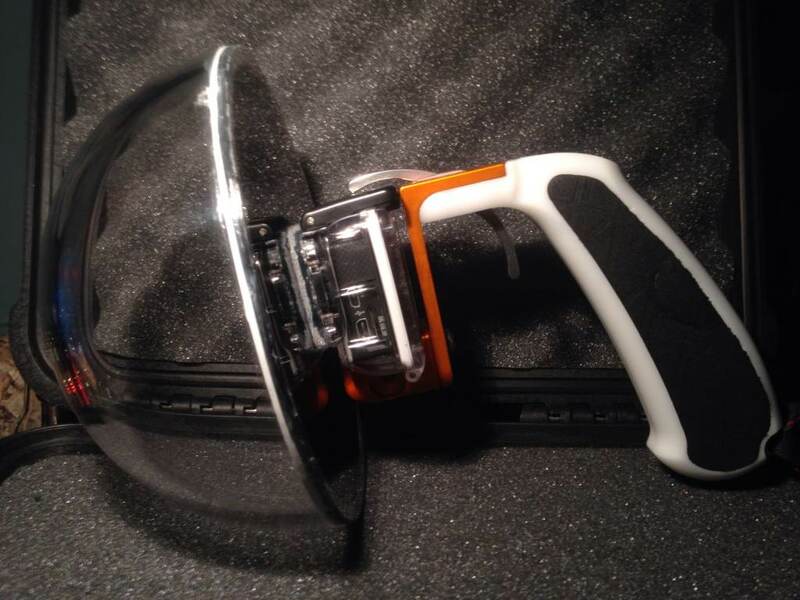 Since the GoPro has an LCD information screen on the front I suggest taping off a little rectangle the same size as the screen before painting. This will keep the acrylic clear and give you the ability to see what settings and storage are currently in use on your camera. Also it would be smart to tape around the very edge of the surface to keep the nicely sanded edge free of paint and to keep paint off the opposite side of the back plate. I tried using spray paint but it turned out to be somewhat translucent and it got crackly while drying. So I went for regular non-gloss household paint instead. Not sure how this paint will be in the long term being exposed to some humidity but it seems to absorb small amounts of water which could keep the dome from fogging. Like I said with the paint you are trying to create a non-reflective surface so after painting two or three coats you’ll want to sand it to a matte finish as best you can. Time to cut another circle! To adhere the dome to the back plate it is a good idea to cut a circle the width of the thickness of the dome wall a third of the way into the acrylic. It just so happened that the diameter of my back plate was the exact diameter of the outer diameter of the dome and so it fit flush with the plate once fitted. To cut the circle a third of the way into the plate I suggest using the table router again and aligning the fence so that you are pressing the rim of the acrylic against it. This will allow you to rotate the plate with out needing a pivot point. 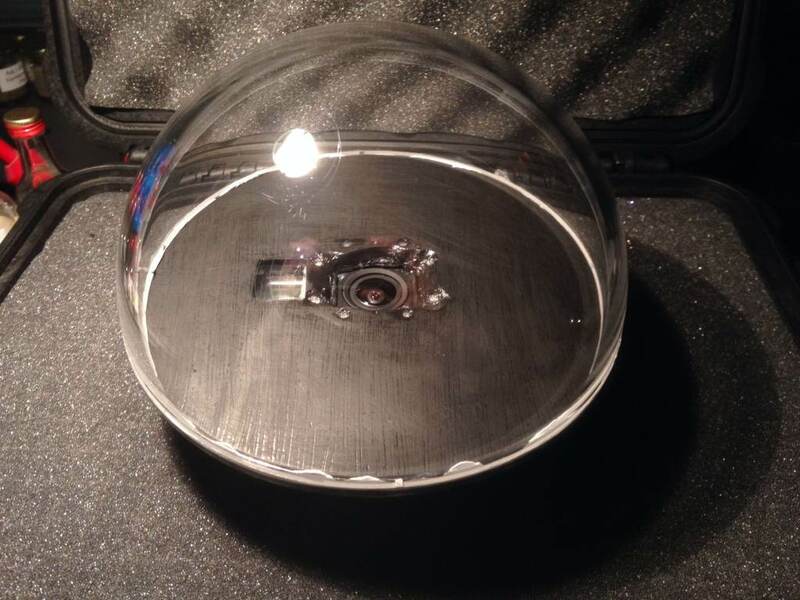 The Gopro wide-angle lens is what this dome port is being built to utilize. The housing was built around the camera and was precisely designed for this super wide lens. 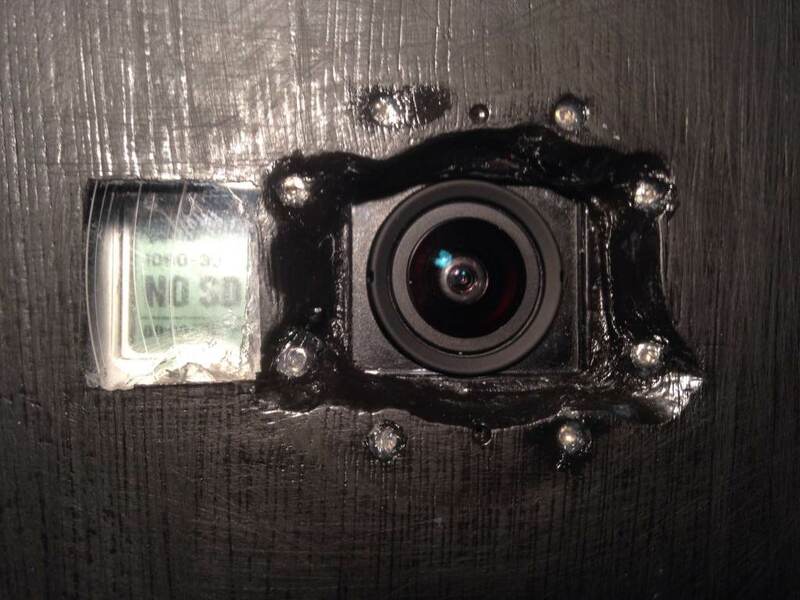 You will realize this as I did when you view what the camera sees through the hole in the back plate. The image will be severely cropped. 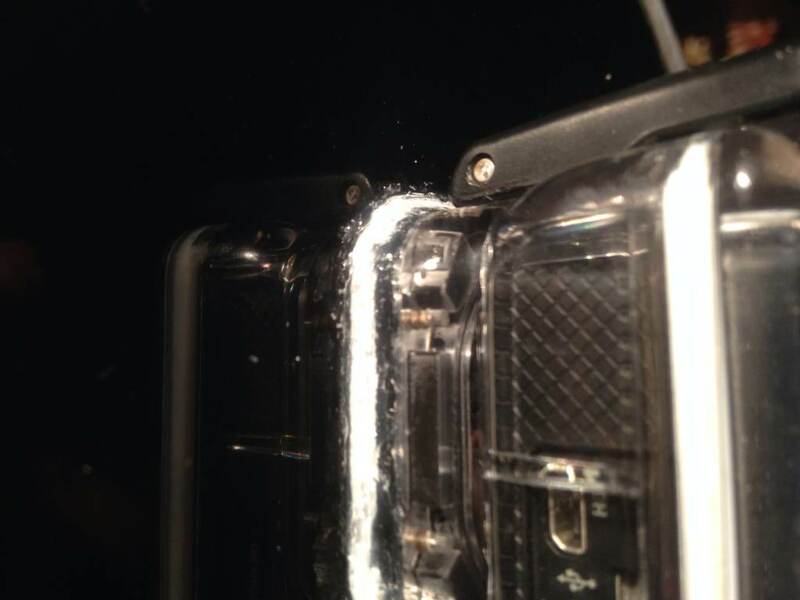 You will need to file down the horizontal edges way back past the rubber o-ring that the glass in the housing uses to keep it water tight, but not past the screw holes you drilled. I suggest using a flat file as opposed to a round one since the top and bottom edges of the hole will not need to be filed, only the left and right side. Keep filing until the edges are out of the viewing area. This will likely make a rectangular hole the width of the plastic retaining ring. Note: when using the GoPro app to view what the camera sees, put the camera in photo mode. It has a slightly wider viewing area. Time to glue the back plate to the housing. Take your epoxy putty and kneed it to a consistent color. Make a thin rope out of it and place it in the groove made for the rubber gasket that was removed. Also place bits between the screw holes. Compress the back plate against the housing making sure all the holes are aligned. Take your silicone sealant and place a dab in each screw hole of the back plate before placing the screws in. After everything is screwed on tight to the housing place another dab of silicone sealant over top the screws for safe measure.If not water WILL leak into your dome around the screws. For extra sealing put silicone sealant around the outer rim where the housing and plate are joined. This will be a little messy but you’ll want to make sure you seal everything. Time to glue the dome. Again kneed the epoxy putty into a thin rope that appears thick enough that it will spread over the width of the cut rim. Sand the bottom rim of the dome to make a rougher surface for the putty to adhere to. Take your dome and compress it hard against the back plate making sure to squeeze the putty rope flat. Once it has cured take the silicone sealant and spread a thin layer on the seam around the dome. Any excess silicon can be carefully scraped off the dome once it has dried. Hopefully that’s inspired some of you to have a go at making your own, if you do go for the DIY option let me know in the comments, it would be great to hear from you. That’s great, do you have any tips on how to prevent water drops? I just spit on the dome port as much as I can during the session and use the wet port technique, do you have a different way of keeping it clear? Thanks for the tip, it’s a new one on me, I’ll check it out. It looks like you’re getting some really good results from the GoPro dome too. hey mate. Would you by any chance make me one? It’s my 21st birthday coming up and my girlfriend don’t really want to spend $500 on a dome from kneckt.. I will pay for parts and postage and labour. Message me on facebook if you can that would be good! to be honest, I don’t have the time or equipment to make one for you. I personally think the Knekt dome is pretty good value, if you factor in all the time and skill needed to make one that good it comes in at over $500. It’s only if you enjoy the process of making the dome (many people do) that it’s worth it. Maybe you and your girlfriend could chip in together for one? They should be back in stock in May I hear. hi Ian, any video tutorial ? I’m not sure Ian checks in on these comments, as far as I know there’s no video tutorial for this guide, but you can find some similar guides on YouTube I’m sure. There are lot of tutorials on line, this one seems the most professional. Which stage are you stuck on? I’ll see if I can help out with some pointers. Can’t find altrnative for underwater filter to insert the lens. 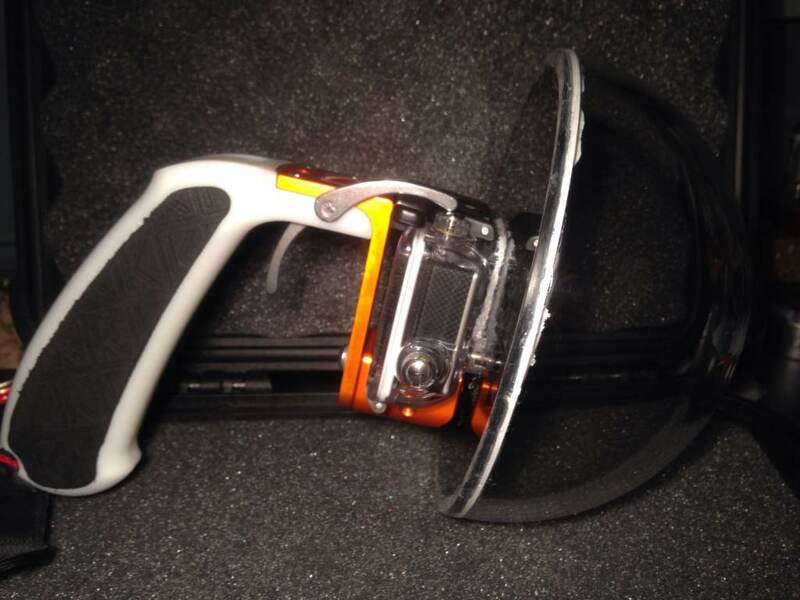 It’s fit gopro but not to sj 4000. I keep getting water into the dome. Hmm, I’m not sure there’s much I can help with there, In Ian’s design he screws the plate for the dome directly onto the housing, is this possible with the SJ 4000? I think you might be able to just order a back plate from them and use the dome you already have, but I’m not sure.